For the Still Air Egg Incubator. Safely turns eggs to exercise the developing embryo. Reduces egg handling to help improve hatch rate. Includes motorized egg turner, large egg cups and two egg rails. Makes one complete revolution at a 30 degree angle side-to-side every four hours. For the Still Air Egg Incubator. 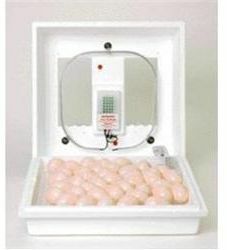 Safely turns eggs to exercise the developing embryo.